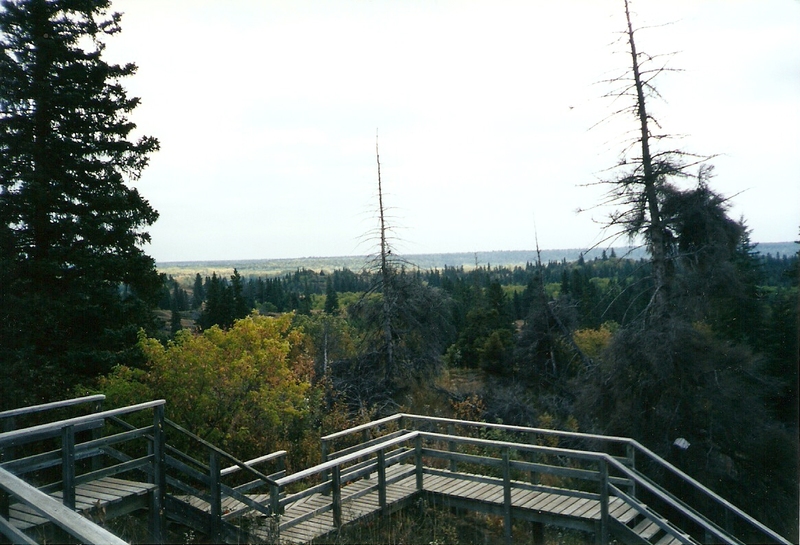 Located on the north side of the Trans-Canada Highway about 25 kms east of Brandon, MB, Camp Hughes Rest Stop offers travelers refuge from the road, washroom and picnic facilities and a fake forest to roam in. The trees are real enough, the forest isn’t. Constructed as a make-work project during the 1930s, the rest stop’s major feature are thousands of jack pines all planted in straight symmetrical rows as you can see in my video. The pines, mature now, have foliage on the top third of the trunks forming a dark, shadowy canopy. The red bark flakes away and on hot summer days, the air is redolent with the smell of pine. Covering several acres, the pines provide a sensual and sheltered place to stroll and stretch your legs. If you stop here, exercise caution because poison ivy is very prevalent on the forest floor. Otherwise, it’s a pleasant and unique walk. Water and wind and their eternal romance with rock, etched into the weary flesh of stone, glowing eloquent beaches appear and disappear in a flash. On the prairies, in blissful perfection, their story never stops. Here we are humbled yet throbbing, ecstatic. There were moments on the Missouri Coteau this summer under a sky that opens up toward you and away from you at the same time when I could feel the mule deer mating just for the fun of it and prairie dogs chasing dragonflies just for the fun of it and evolution happening just for the fun of it! The eternal romance, The Imperative, echoes of Spirit bounding and rebounding everywhere! Last Friday evening I sat under ancient silent cottonwoods and watched the red September sun sink below the Trans Canada Highway just north of Carberry, MB. I was staying at the Robin’s Nest Motel and Cafe (for the price, I recommend it). It is dry now and harvest time so the sunset was tempered with a fine yellow haze that lingered on the horizon all day. Swirls of sylphs dreamt above the setting sun. Silhouettes of dog walkers moved against the yellow horizon, crickets chimed the eternal temperature, the motel buzzed and the TCH hummed along. The dust turned the dusk to pink deepening to red, wisps of pale yellow meandered across the haze. The night cooled from near 30 degrees C.
Under the friendly cottonwoods I thought of what I had gained over the past two days of travel in southwestern Manitoba: my energy level was very high due to lots of sunshine and discovery, on which I thrive. I was learning, yearning and leaning – everything a man could need! I was doing what I had yearned to do: to travel, see new things, meet new people, get ideas, feel at home wherever I go, bring Spirit out in myself, set the example, be the change! The next day I returned to the city but detoured to Beaudry Park just west of Headingley for a couple of hours in the shade. It was a hot, hot day and the trees were alive with voices. In the distance I kept hearing trains. I had wanted to videotape a fast train. I love the noise, horizontal movement and the earth moving up and down with the weight of the speeding train. When I left the park I explored toward the sound. I crossed the Canadian National Railway mainline on a gravel road and shot a video of a fast freight that came by about 20 minutes later heading west. If you don’t have to be anywhere in a hurry and you’d like to watch a long fast freight train go by close up with great sound, click this into your life. 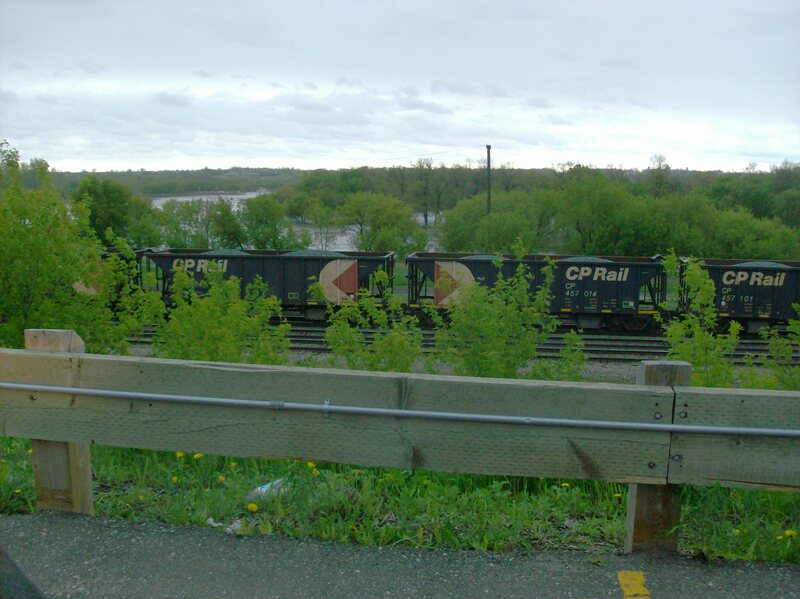 Shot Saturday, September 10, 2011 at the CNR mainline crossing south of Beaudry Park on Manitoba PR 424. Train freaks will get a chubby, guaranteed! Watch for the engineer waving. On the prairies in late summer – around now – there is a moment when the heat holds its breath and the cold sneaks in, a glimpse of our inevitable future, making the skin on our brown bodies tighten. Today that moment, the hinge, arrived. The north wind chills us today, reminds us today. 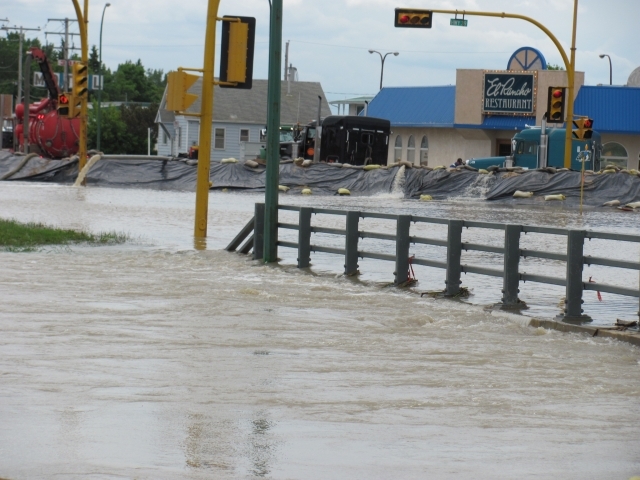 After receiving over 120 mm (about 5 inches) of rain in two days, Weyburn, SK is under a state of emergency due to flooding downtown, failure of their water treatment plant and continuing heavy rains. Down the road in Estevan, SK things are getting worse. I stayed in Estevan at The Derrick on Monday night. A small lake formed behind the hotel and inched slowly toward the building while it rained all night. 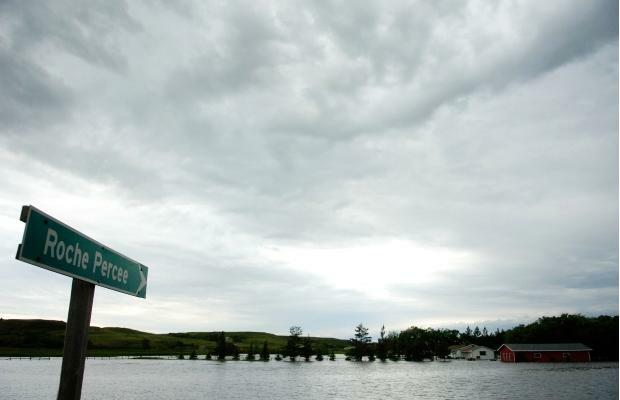 A trailer park has been completely evacuated, homes have been lost, both dams that face into the city are under the duress of unequalled amounts of water and it continues to rain. 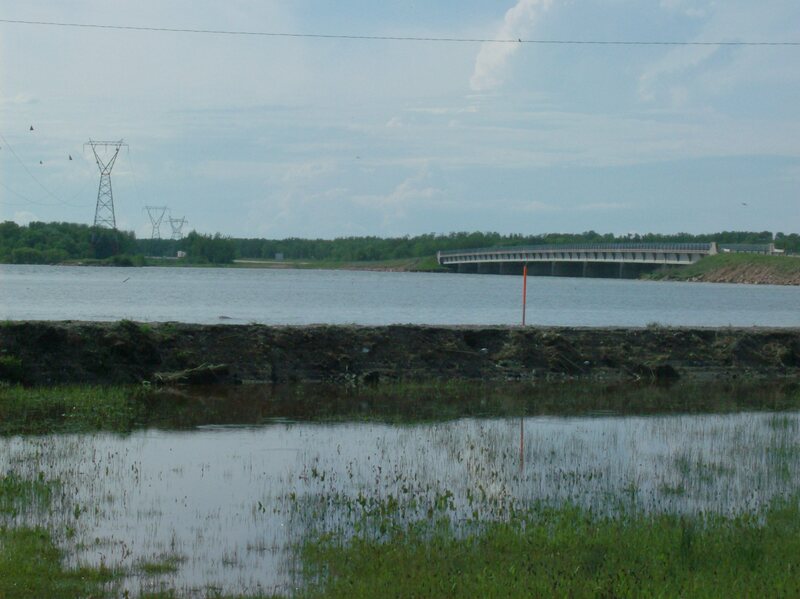 Boundary Dam holds back the water of Long Creek and is Sask Power’s largest thermal generating station and the largest lignite coal-burning station in Canada. The Rafferty Dam holds back the Souris River forming the gigantic Rafferty Reservoir which stretches northwest for 57 kms. Both dams are at their max as far as volume of water in their reservoirs. To relieve some of the pressure on the dams, record amounts of water are being released from both dams. This water becomes the Souris River. 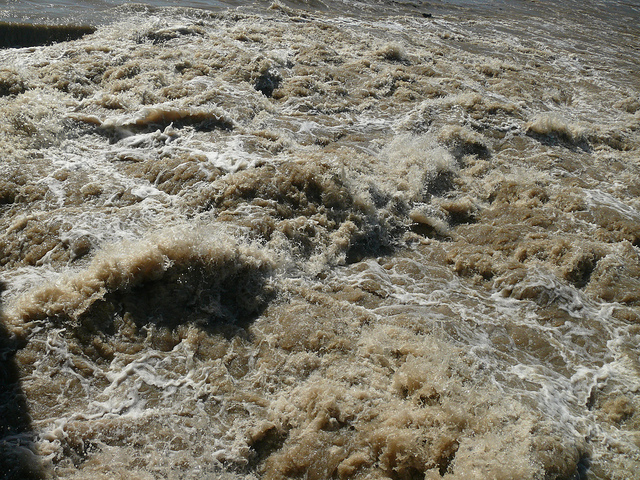 Estevanians fear that if either dam breaches, the city is in big trouble real quick. 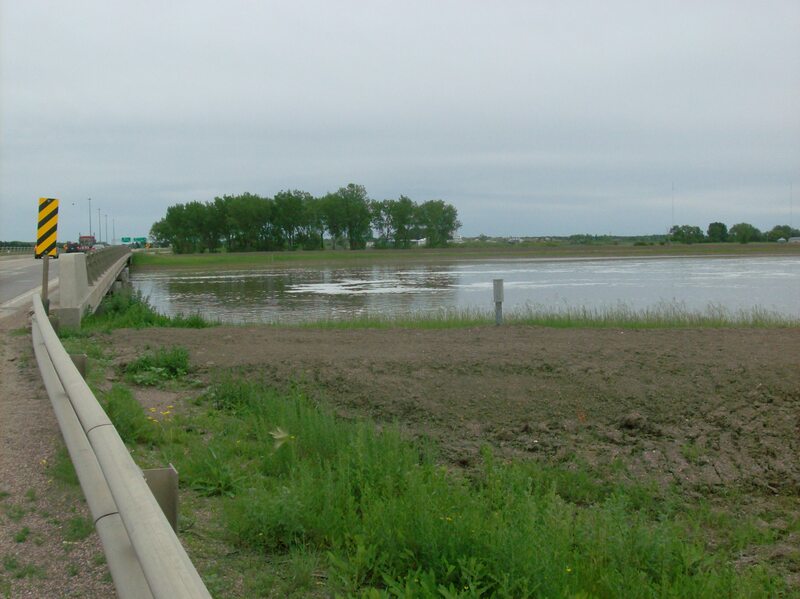 Highway #47 south of Estevan is closed due to flooding as is Highway #18 west of Estevan. 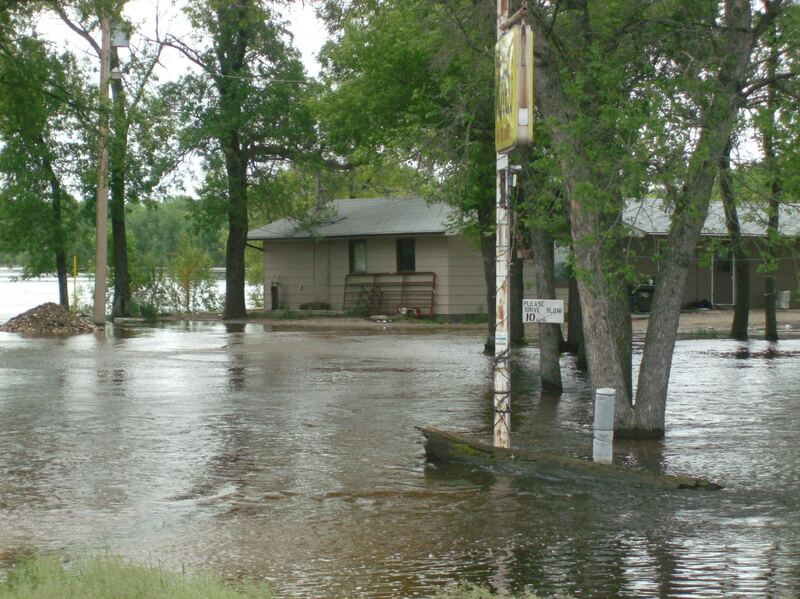 Meanwhile, just downstream from Estevan and the dam outlets is the little village of Roche Percee, situated on the banks of the engorged Souris River. 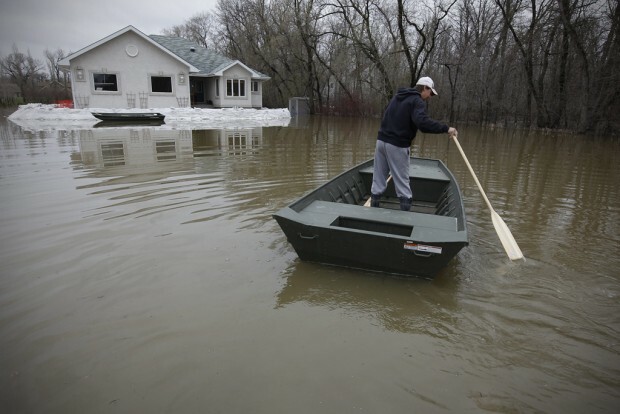 180 people have been evacuated and at least half the homes in the low-lying portion of the village are believed to be almost completely underwater. 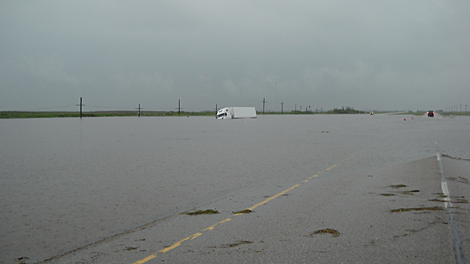 A 150-km section of the Trans-Canada Highway is closed in Saskatchewan, due to water over the highway. The closure stretches from Whitewood to Balgonie with traffic detouring via Highways 9 and 10. 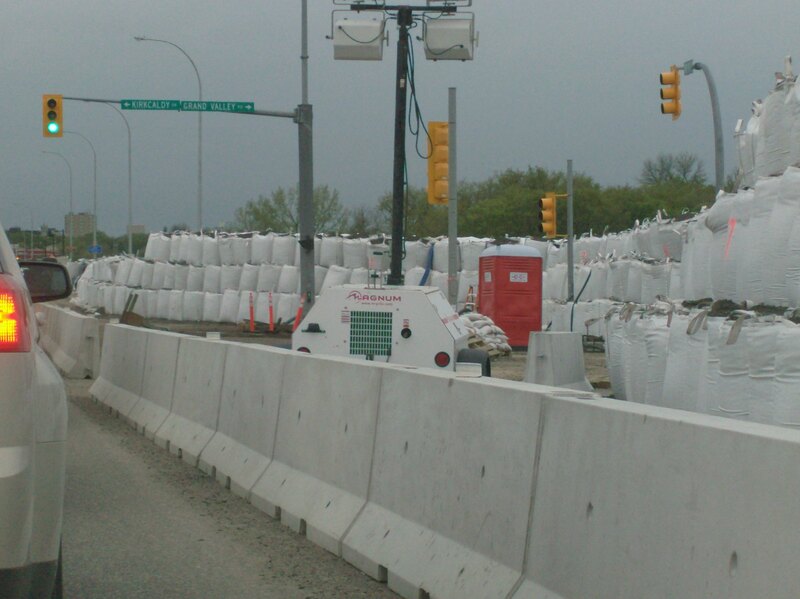 Local traffic can access Sintaluta and points west from Balgonie, and Wolseley and points east from Whitewood. 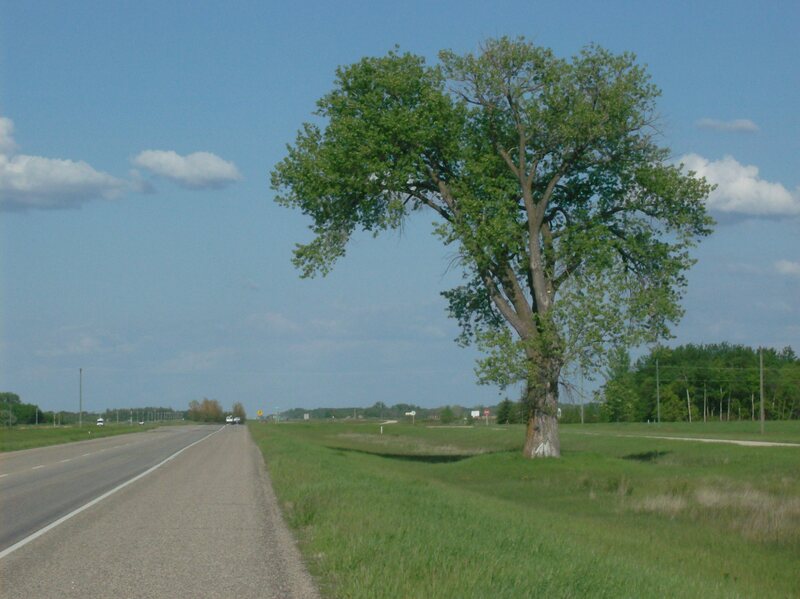 Last Thursday I drove a 650 km loop around Manitoba that began on the TCH, then Hwy #16 then Hwy #5 into Dauphin. The Whitemud River has subsided but there are miles and miles of fields still completely covered with its floodwaters from ten days ago. 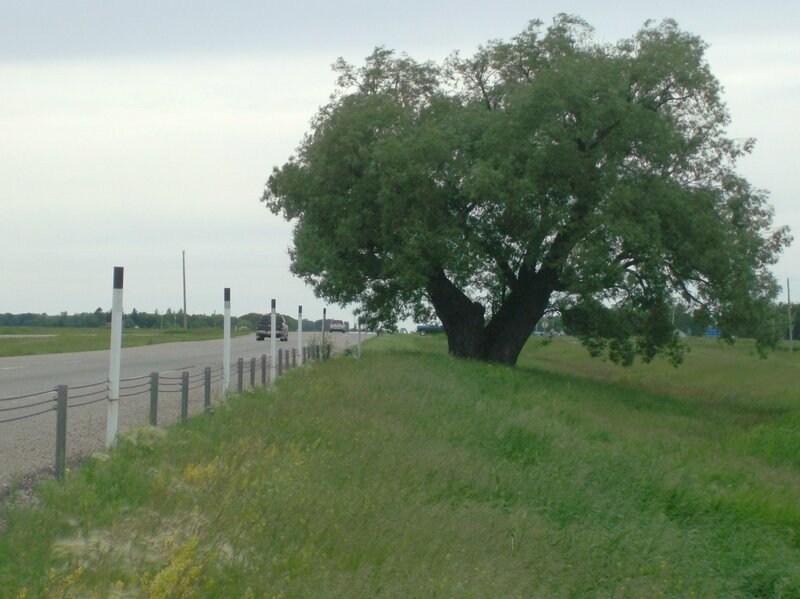 This is most evident along Hwy #16 between Woodside and Neepawa. 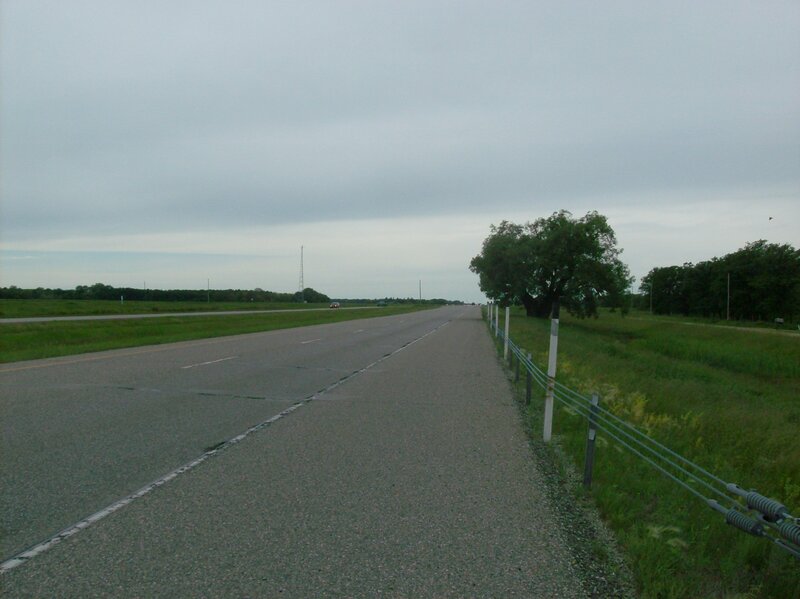 I returned via Hwy #68 through the Lake Manitoba Narrows. The pictures of The Narrows give you an idea of how high the water is. All along the lakeshore there are inundated homes and people still scrambling to build dikes against the rising lake. 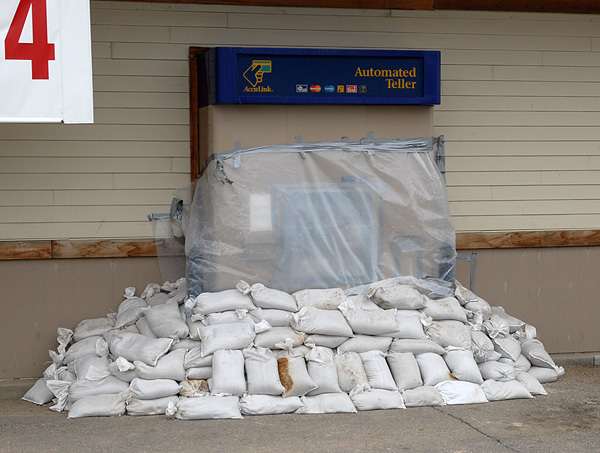 I passed at least six different points where sandbags were piled and available to the public. 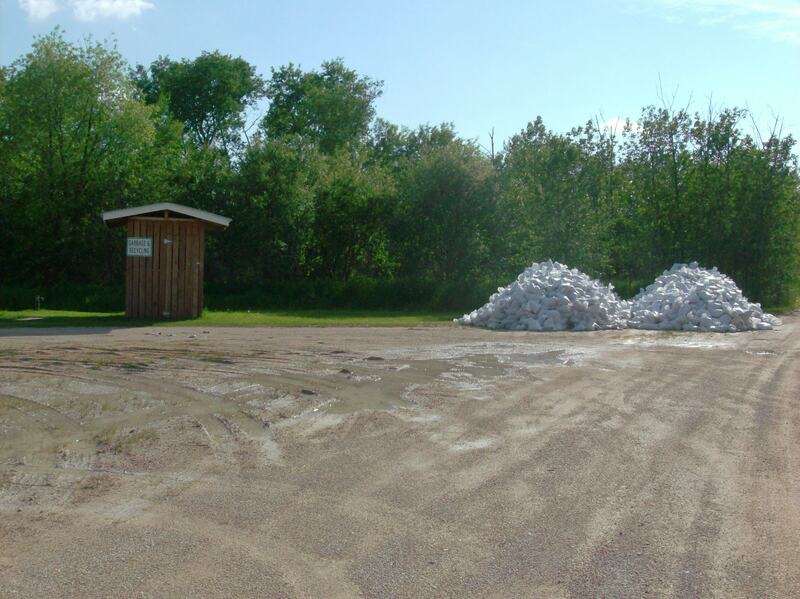 This picture is in McEwen Park in Eriksdale on the east side of Lake Manitoba. Watch a short video of the situation at The Narrows. 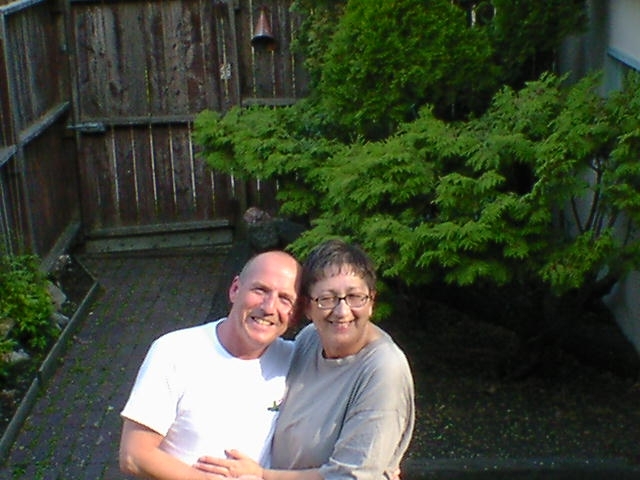 Since her death nearly 18 months ago, Linda has communicated one simple and helpful message to me repeatedly: Be Happy! It has come in many forms – from her beautiful gentle voice saying it in my head to suddenly implied by gestures I see in others to full-blown experiences of the spirit world in trance to small bliss currents that happily billow through my consciousness. Whatever the messenger, the message is the same: Be Happy! Last Friday afternoon, as I was driving down the Trans Canada Highway coming home from my flood tour, I was beset with anxiety about returning to the city hive and its noise and bother. 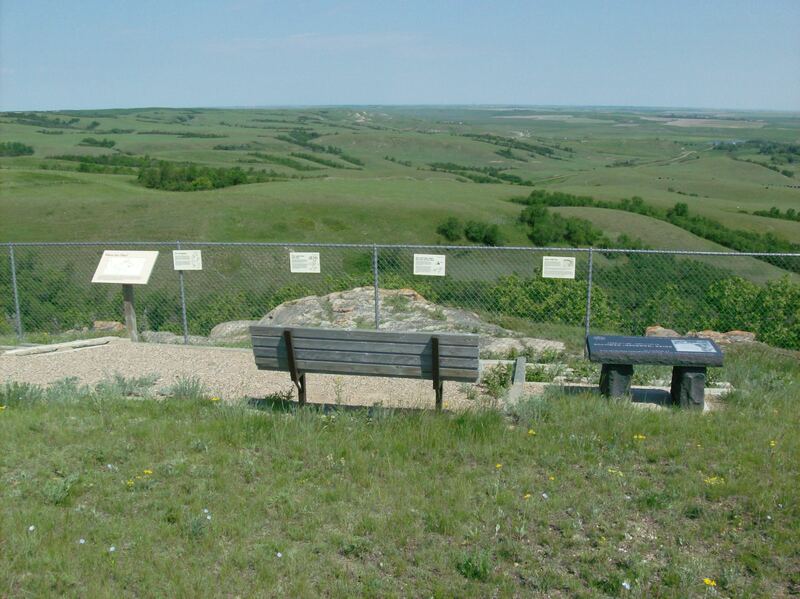 I’d spent the morning sitting in a camp chair about a quarter of a mile up the north side of Riding Mountain, looking out over a forty-mile view that included Dauphin and the Duck Mountains beyond. Idyllic, quiet, peaceful and the opposite of what I was heading into. Just as these thoughts arise, a sporty candy-apple red SUV passes me. You couldn’t miss this vehicle. Its licence plate said, “B Happy.” I chuckled heartily and thanked Baby for reminding me in yet another inventive way. Thank you Linda, my angel. We’re not out of the woods yet. Keep rubber boots handy. As I left Brandon yesterday afternoon about 4:30 an ominous black sky promised wild weather ahead. Three miles south of Brandon on Hwy #10 (I came home via Hwy #2) it was raining hammers and nails. I had to pull over several times due to zero visibility, light the hazards and wait out the deluge. The lightning flashed and the thunder roared around me, ditches filled, fields turned into lakes again just like earlier in the spring. It was a classic prairie storm that the ancient Brandon Hills took with a small sigh and tried to absorb. 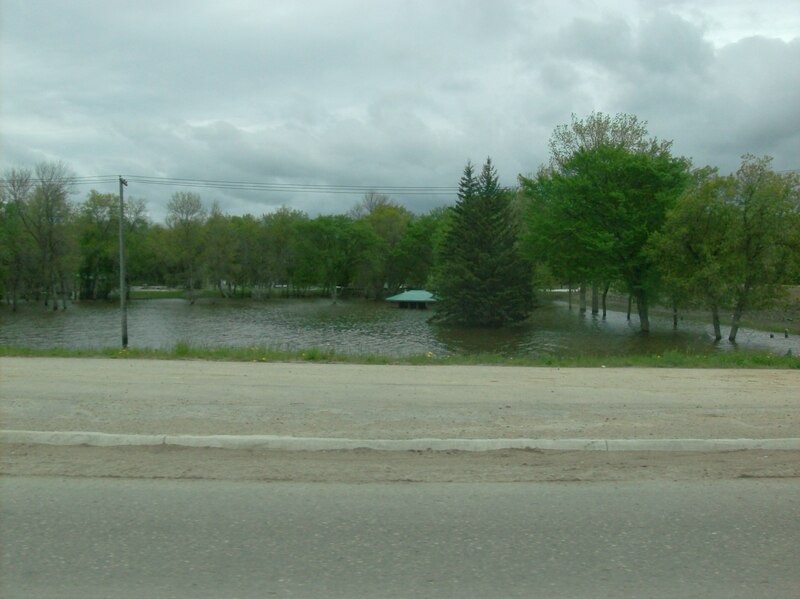 Manitoba is saturated. 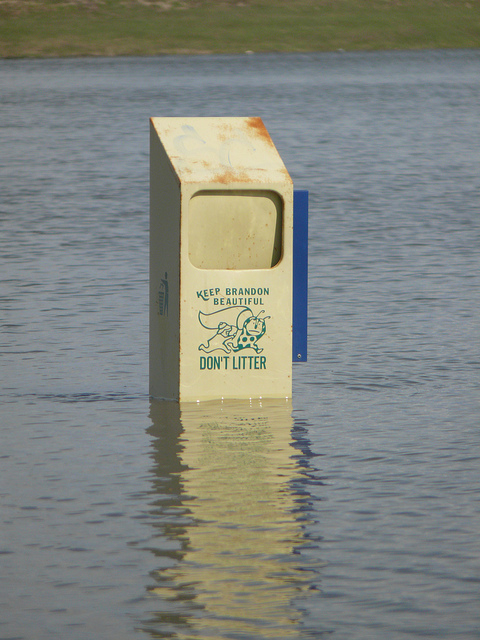 After last year’s wet summer and fall, the ground is unable to absorb any more moisture. Heavy rains like this one damage seeded crops and hamper seeding efforts. Every region is behind in seeding this spring. The central part of the province has 50 to 60% seeded, the eastern region between 25 and 40 percent of cereal crops are seeded and in southwestern Manitoba farmers have managed just 10% of the seeding so far this year, according to the latest crop report from Manitoba Agriculture. 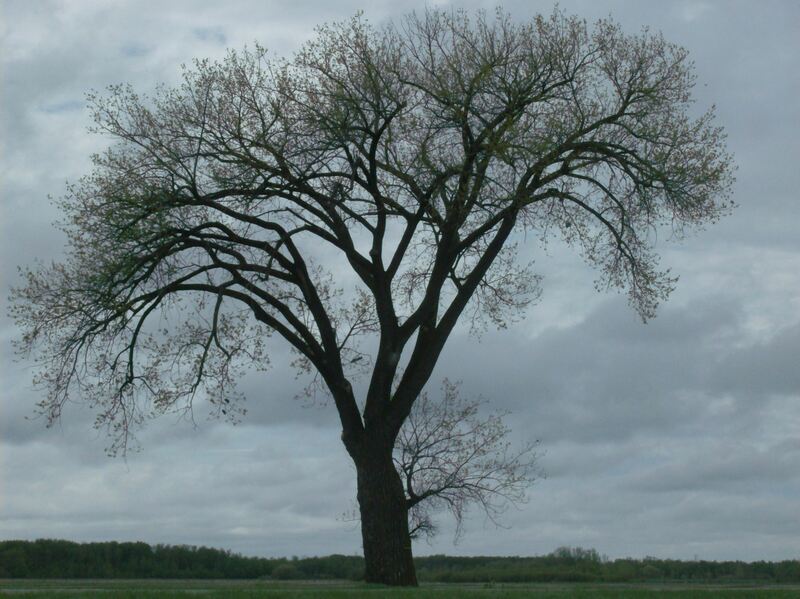 Rainfall amounts varied yesterday but some were substantial: Souris received 88 mm/3.5 inches, Boissevain 64 mm/2.5 inches and Brandon 53 mm/2.25 inches. 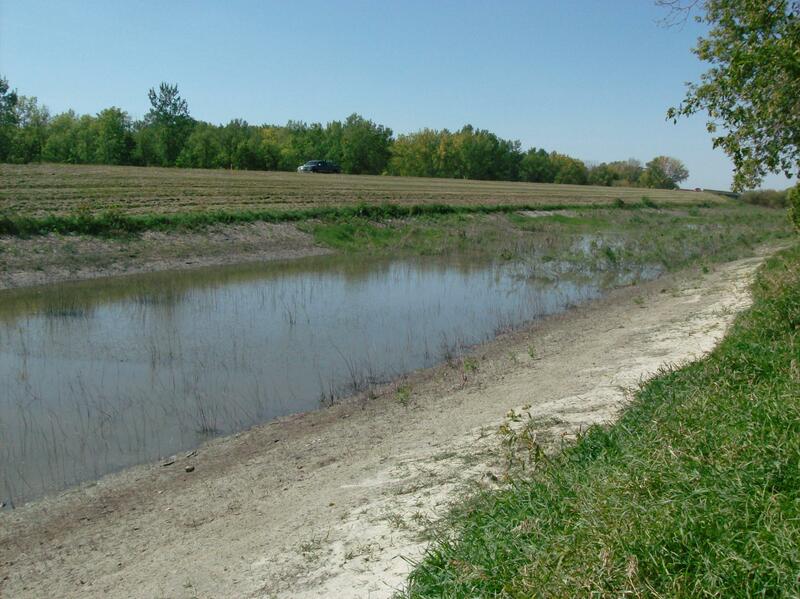 The headwaters of the Assiniboine also received heavy rains this week. 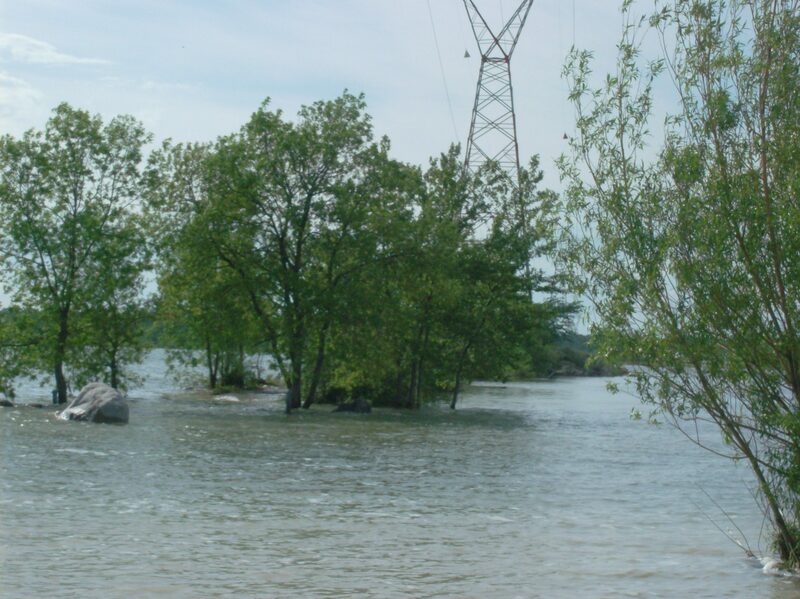 Manitoba Water Stewardship is predicting an increase of at least 2 feet in the Assiniboine over the next week because of the new water. 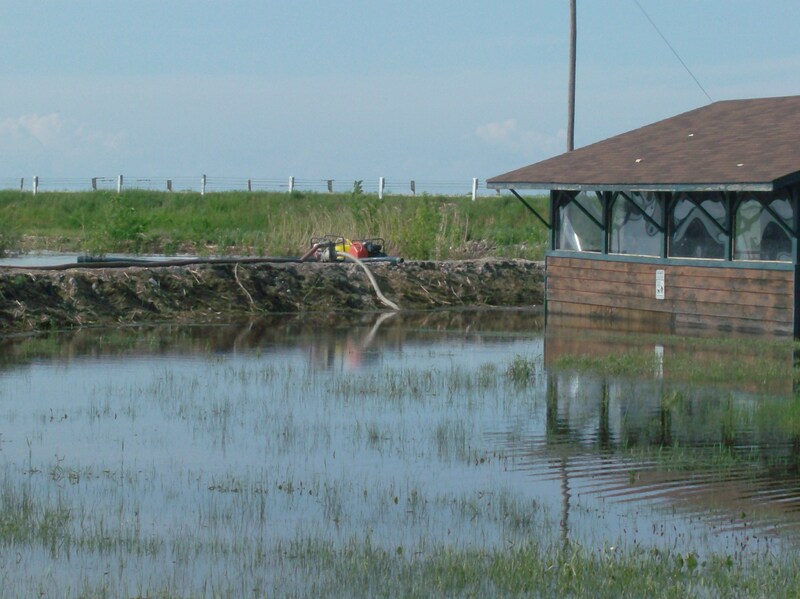 Sioux Valley First Nation have begun new evacuations. Today most of the southern part of Manitoba, including the major lakes, is under a wind warning with gusts up to 90 kmh with showers in most areas. 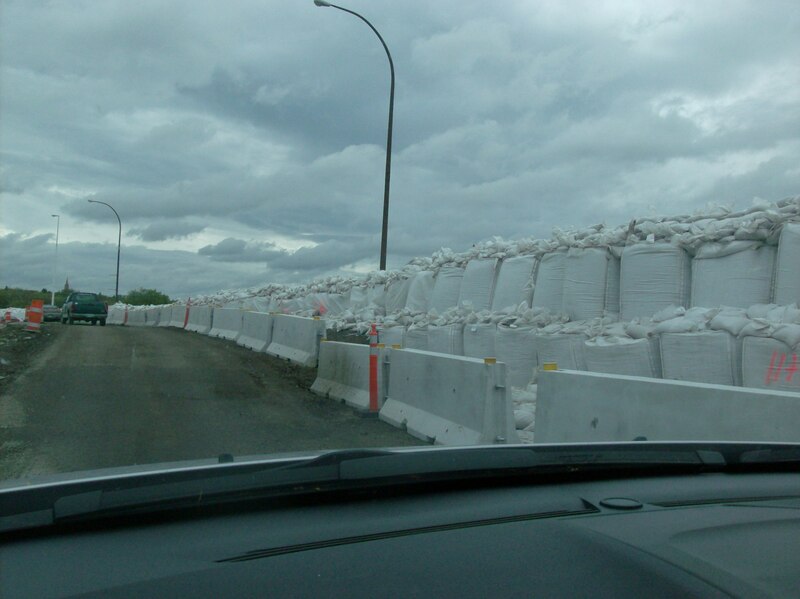 This is putting extra stress on dikes and on emergency crews in Brandon. Minor breaches are occurring but so far the pumps have managed to stay ahead of the leaks. 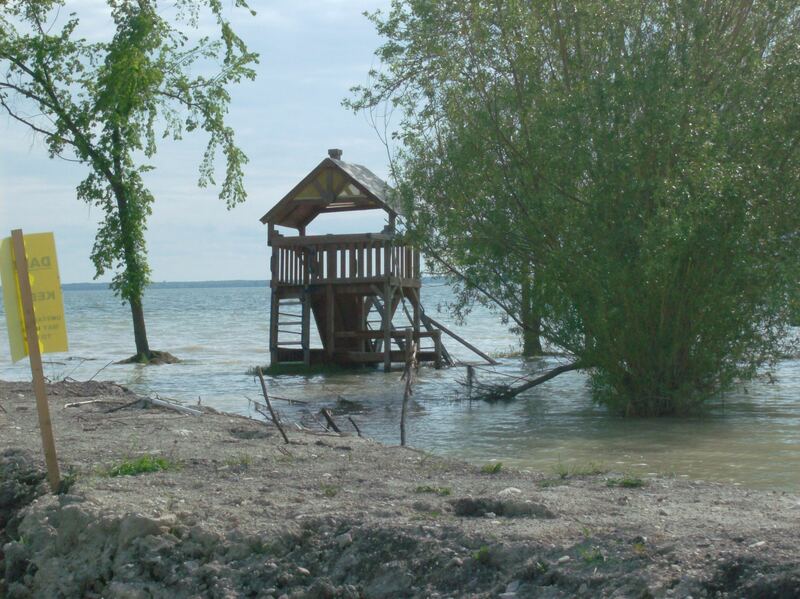 Wind-driven water in the lakes including Lake Manitoba, Dauphin Lake, the Shoal Lakes is washing on land and many properties are inundated. 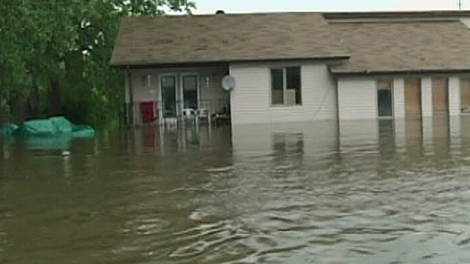 Hundreds of people around Lake Manitoba and area are now on mandatory evacuation. How much new overland flooding will result from the rain and wind will be better understood by the weekend. 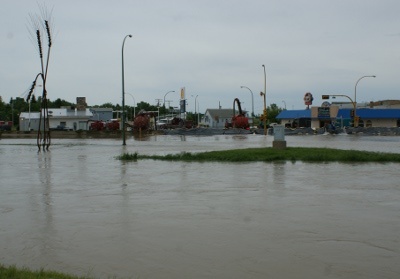 Elsewhere the Grand Valley west of Brandon, though still heavy with water, hasn`t overflowed the Trans Canada Highway. Spruce Woods Provincial Park remains closed but for a few of the high ground camping spots and yurts. All aspects of the park remain off-limits or inaccessible, Hwy 5 is still closed so camping access is via Steel`s Ferry Road off Hwy 2. Overall, we are getting exactly what we don’t need this week – more water and high winds. Depending on the flows, precipitation and winds over the next few days, the status of our flood situation may change drastically. Stay tuned. The Assiniboine hasn’t crested yet. 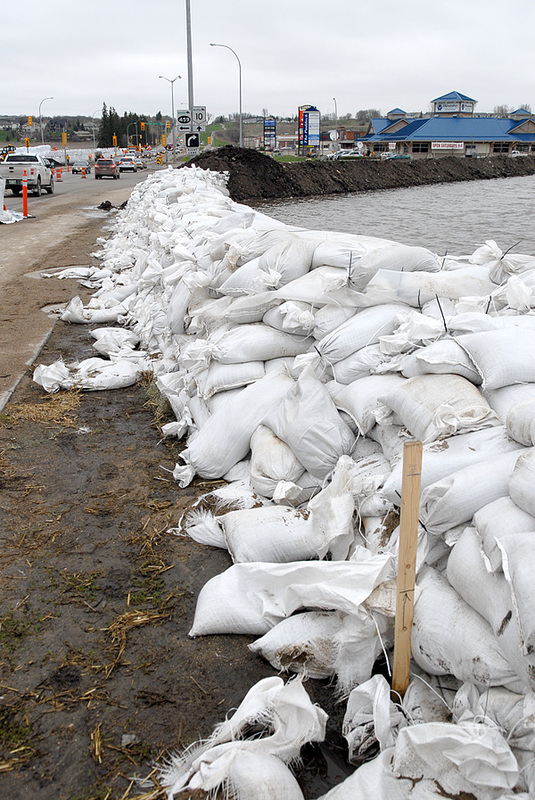 Brandon is in for weeks of high water levels requiring patience and forbearance. This morning new precautionary measures were announced. The Corral Centre and adjacent Paddock shopping centres are now under mandatory evacuation. The few stores still open are closing today. 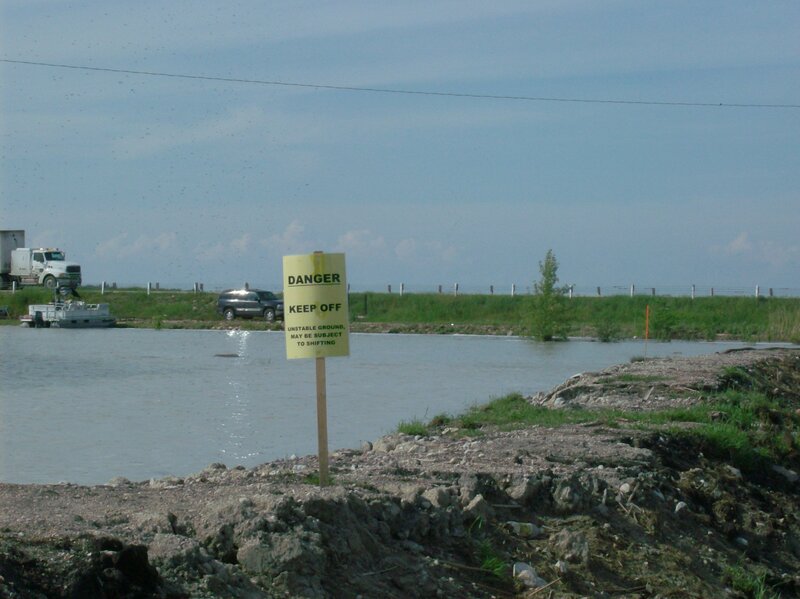 Traffic and speed limits on 18th Street are being restricted due to concerns about vehicles crashing into dikes. 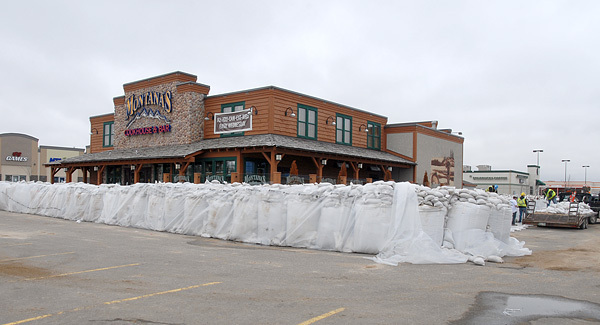 Fifty thousand more sandbags have arrived in Brandon to increase the dikes by another 30 cms to accommodate new higher water levels announced by the province today. 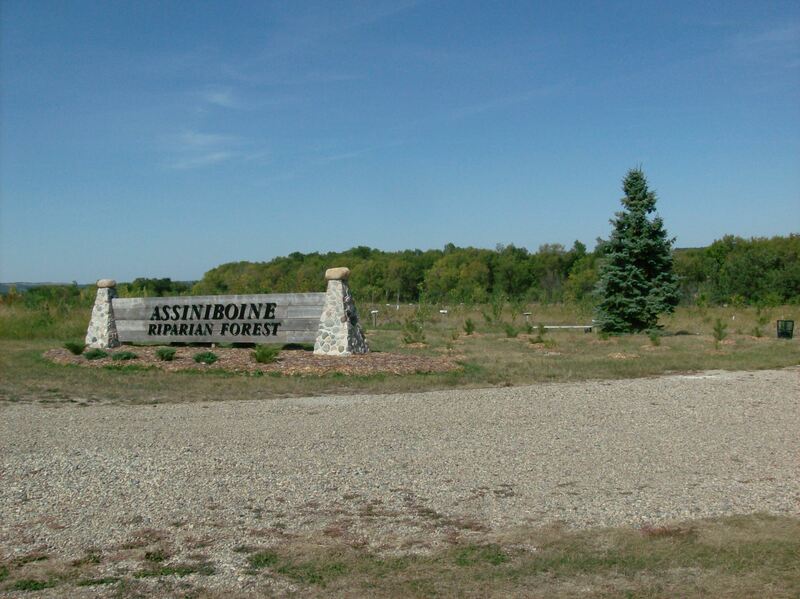 The crest of the Assiniboine is still a few days away according to Manitoba Water Stewardship. When it arrives it will be a prolonged crest, at least three days. No new residential evacuations are planned. Over 1300 people have been forced out of their homes so far. 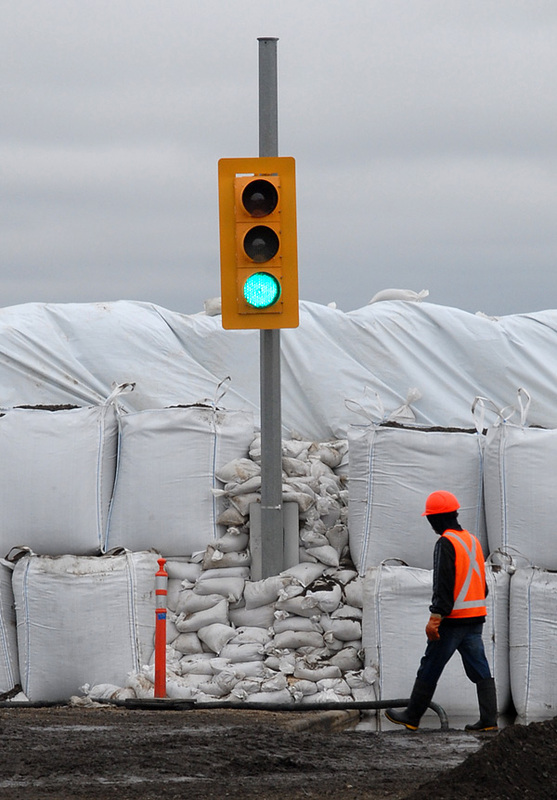 The few stragglers left in the flood risk zone have indicated they will leave today. 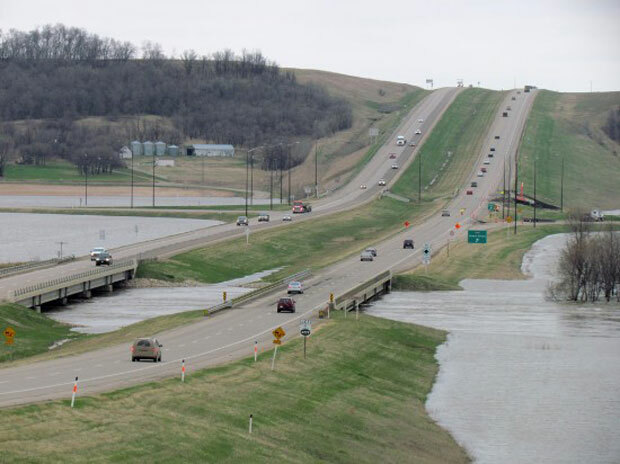 The Trans Canada Highway remains open despite rising water levels in Grand Valley. There is no water on the road. 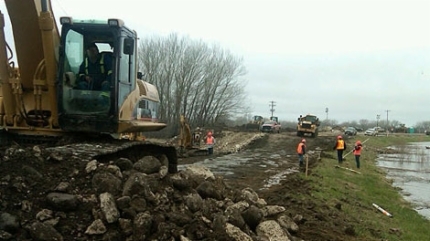 The province’s decision to let river water intentionally flood an area southeast of Portage la Prairie has been put on hold for now. 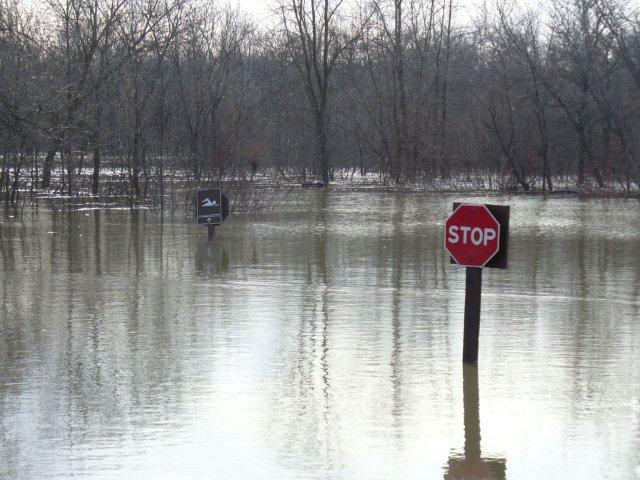 The flooding was supposed to occur at 8 a.m. this morning but now an announcement will be made this afternoon at two. Many of the residents in the “controlled” flood area had some loud and nasty things to say to the media yesterday and this morning. The premier is considering his future here and one can only hope this move was vetted by multiple engineers with credentials and experience but no political motives rather than the egocentric dreams of a single-minded politician looking to “save Manitoba.” The Manitoba website promised a map of the whole area to be intentionally flooded but none appeared and is still not available today. This is not a good time to keep people in the dark! 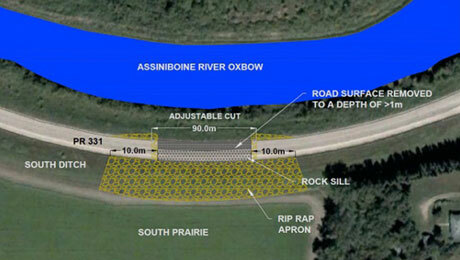 Below is a diagram of the proposed site at Hoop and Holler Bend where the intentional flooding begins. 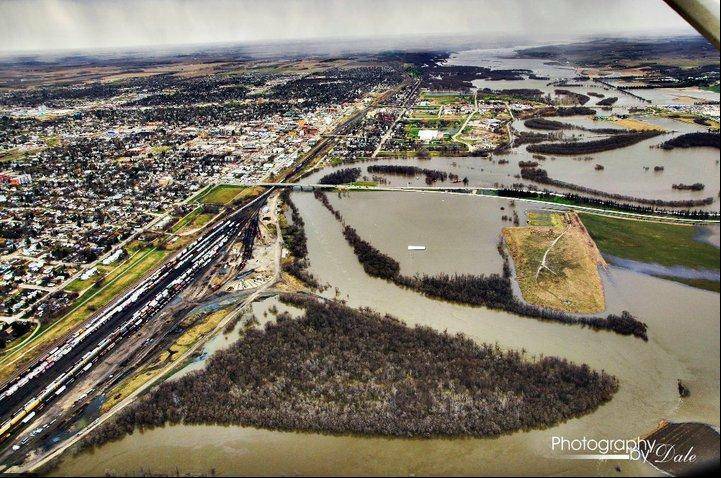 This is an aerial view looking east down the Assiniboine Valley at Brandon. The river is flowing away from you. 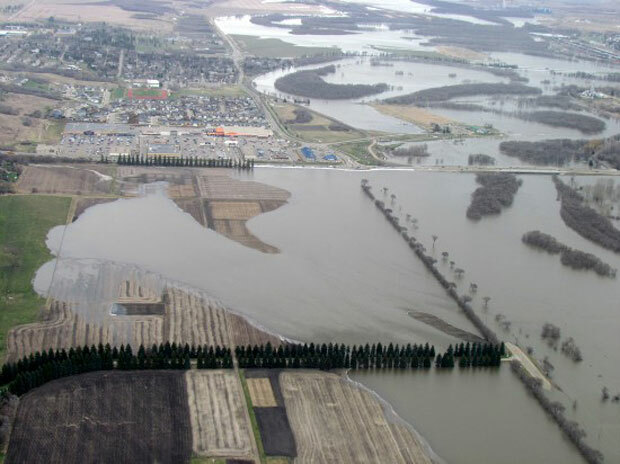 In the foreground the double row of spruce trees is the flooded entrance to the Brandon Experimental Farm. Perpendicular to that, water covers Grand Valley Road. 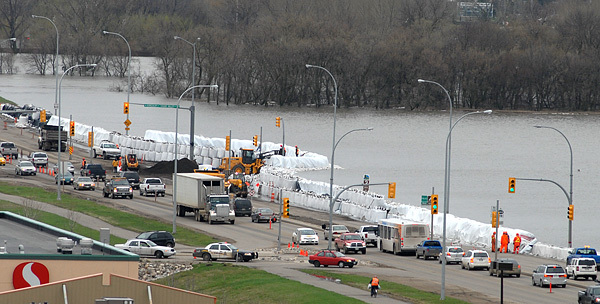 Beyond that the row of spruce trees and white dikes indicate 18th Street, still open with one lane in each direction. Traffic in Brandon is tangled, to say the least. On the left of the picture, past the spruce trees is Corral Centre, the big mall that is now closed, and past that two residential areas. Right centre is the 18th Street bridge, the only outlet for the river. 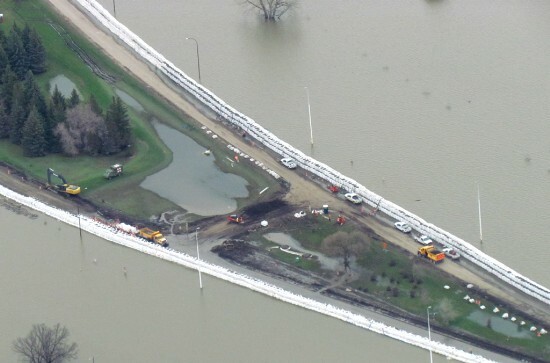 On the right side of the picture and off into the distance, the Assiniboine is creating its floodplain. 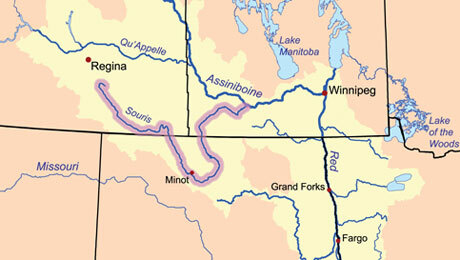 This is a picture of Grand Valley with the Assiniboine flowing left to right. 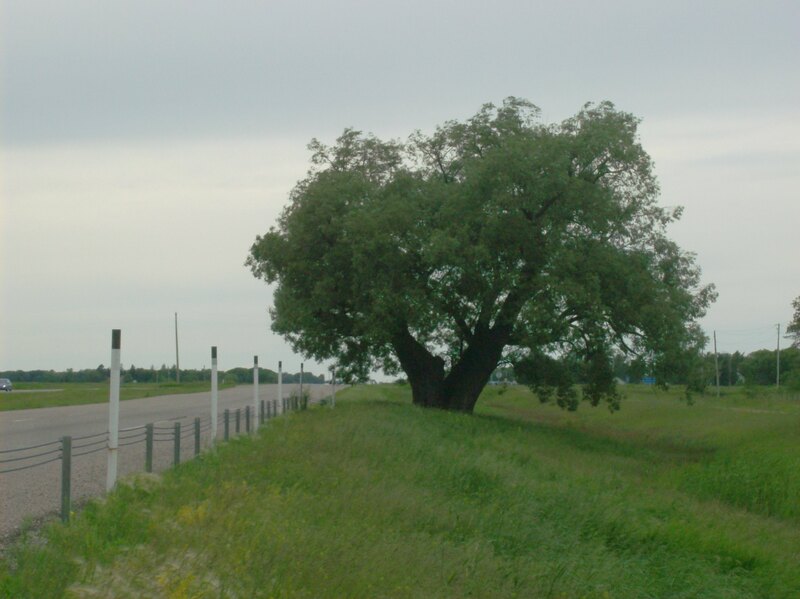 The Trans Canada Highway crosses the river here, about 15 kms west of Brandon. Today there is mounting concern that when the crest arrives, within the next 2 days, the TCH will be impassable. My next report later this evening. In the summer of 1990 Linda and I went for a long drive hitting thrift and secondhand stores all over Manitoba and Saskatchewan. On the Trans-Canada Highway east of Regina in Whitewood, we stopped at Old Geo`s, an antique store in a beautiful old two-storey buff brick house. 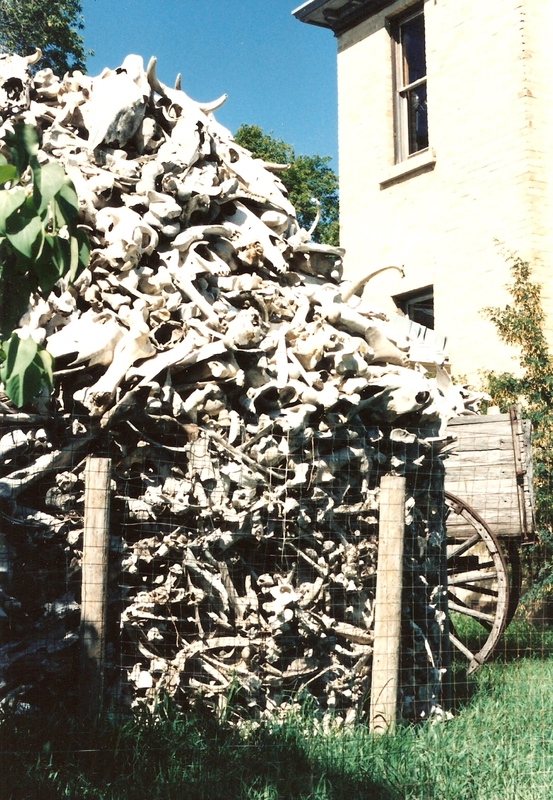 Outside the store, there was this display of the bleached bones of buffalo and cattle collected from the Saskatchewan plains over the past century. It was a striking sight! 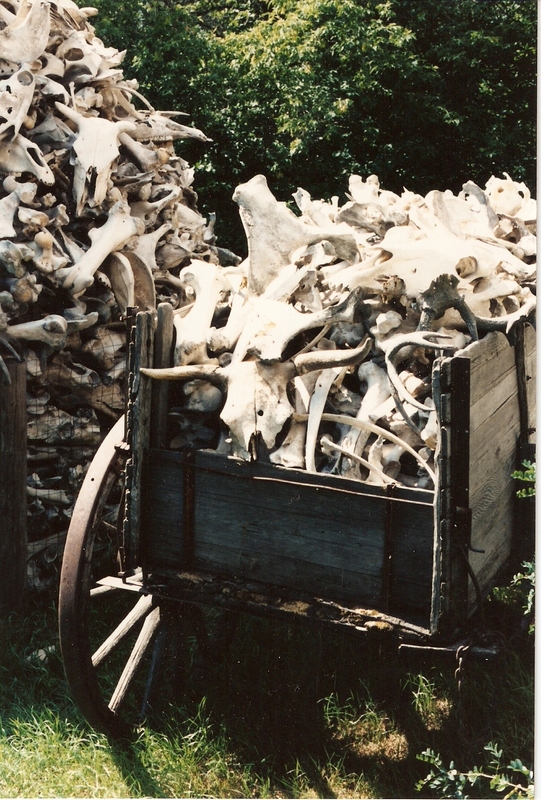 I`d be interested to know if, 20 years later, the bones remain on the same site. Anybody know that? The Cree call it Manito Ahbee; the tourist guides call it Bannock Point Petroforms. Whatever it’s called, this easily accessible place is ancient, alive with Spirit and a creation site. 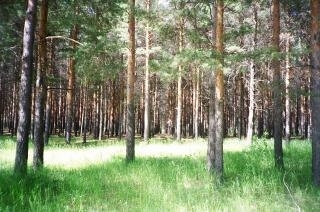 The dense forest gives way to open areas of dark, pavement-like rock. Patchy carpets of dry crackly black moss grow on the tablerock. 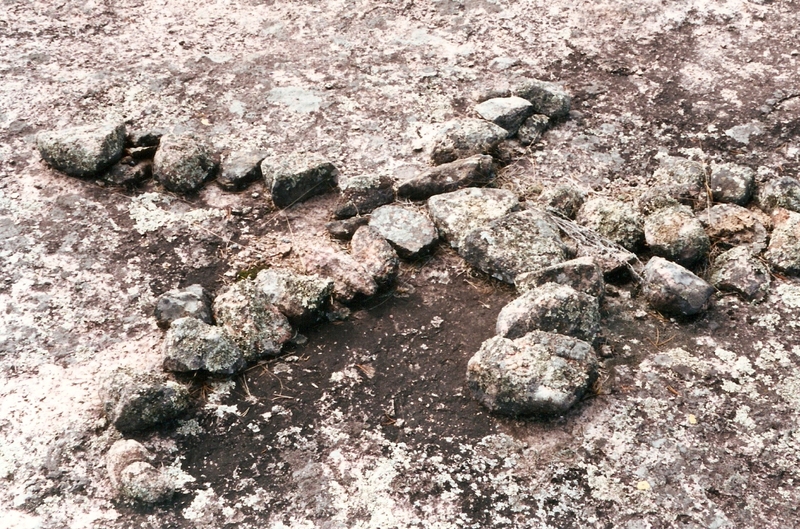 Human, snake, turtle and other shapes are laid out on the bald tablerock of the Canadian Shield in Whiteshell Provincial Park, rocks just slightly younger than Spirit itself. This is where Webbed Flight, my spirit helper, lived about 1200 years ago. He is very energized every time I visit here, as he is today. As I arrive, the clouds break into pieces of the sky and the day warms quickly. After smudging, I step into the fresh spruce aroma of the Whiteshell. Immediately I am welcomed, calmed and reassured by Webbed Flight that I am protected here. I say a short prayer of gratitude and, singing my power song, walk the short path to the site. I shiver with a strong and benevolent Bear presence and with the love I feel from the local spirits. Creation legends say Great Spirit set the Anishinabe people down on Earth here among the rocks and trees. The energy flow from this places rushes westward. The Anishinabe followed that energy and their culture of animal symbolism diffused across the prairies. Today a reverent stillness pervades the place. I wander the site with Webbed Flight strong and available to me. He sings his short raspy song; I feel his bliss. He is home! I sense his delight when a snake effigy, short, old and big-headed, almost knocks me flat as I stand at the end of its tail, toes touching the last rock. Snakes are short power vectors that concentrate energy into intense bursts. Instead of falling, I sense flight and regain my balance immediately. Deeper in the site, the head of another snake sends me into spontaneous dancing, gesturing and singing. Movement is very important here, so much open space to inhabit with it. Spirits abound in all corners of the site, the edges are alive with forest elementals and at ground level there is a greenish haze from the abundant snickering lichen. Off on an enormous flat stone, a large ceremonial circle with openings at the four directions encloses trees laden with colourful cloths. Tobacco and other offering abound on the stones. How much divinity has passed through this place? How long has the human spirit communed with the Absolute here? This place has existed for but one moment – this moment! I circle it slowly, presently, rattling softly. Songs spontaneously arise in me surging out of my mouth into the warm day. My hands gesture a visual language accentuated by chest thumps. Deeply communing with Webbed Flight now, my voice becomes his, my words his meaning, my breath his wisdom. I feel balanced, a completion occurring every moment. I am ecstatic to give voice and sacred manner to the loving powerful spirit of Webbed Flight, my friend, my mentor, my guardian. I am Aspen Smoke because of him and his naming. Over the years, Webbed Flight has guided me on the path in my brightest moments and searched til he found me wallowing in the darkest mires. He lives again through me but never have I experienced his being with such power and clarity, such love and perfection, as I do when we share this familiar place. Here we both living the same dream. We are the conceptualizing animal, thus able to give meaning to Nature. Here, to express the unfathomable ancientness of these exact rocks, ancestors created sacred forms and figures with pieces of old old rocks. It is impossible for us to know the lack of cynicism and trust in Spirit these people felt as they laid rock next to vulnerable rock on barren stone. It was body-to-body communing, the living earth inhabits the living body and vice versa. At the same time, Spirit rides that delicate balance, Eros and Agape, the One into the Many, the Many into the One. Other sites in this series have that same reciprocating flow. Rocks once touched by ecstatic shamans still pound with the power of creation, thrum with a sense of place from which creativity springs. Sometimes the safety I feel at these sacred places is almost unbearable. I am in a state of grace, liquid in the environment, welcomed, even coddled. I share this feeling with Webbed Flight and we sit together on sitting stones he first knew as a boy. 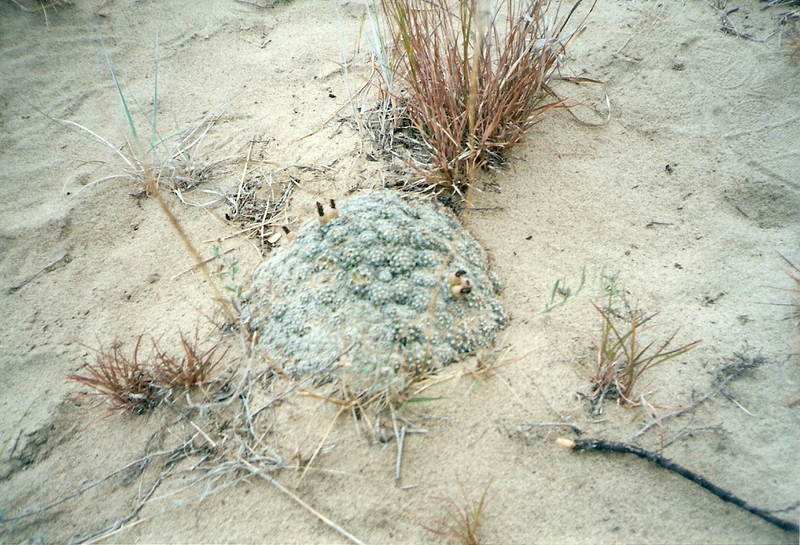 As a shaman, he claims to have made petroforms here himself, imbuing them with the necessary power and symbolism. Roaming away from the circle, I find a small abstract design tucked under a bush. I strip off my shirt and perform my warrior tai chi around the little cluster of stones. I can’t stop smiling. Neither can Spirit. 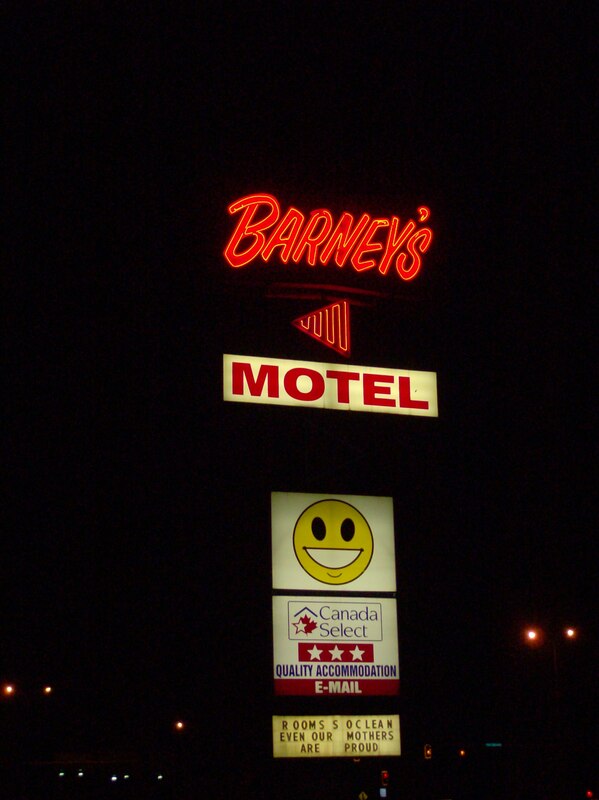 For no discernable reason I could see, the tourist guide says Barney’s Motel was nominated as “funniest motel in Canada,” unless they meant, “But not funny, “Ha! Ha!” and you consider red ants crawling about your room hysterical fun. All rooms face the highway but there is virtually no traffic sound inside the room. A friendly park bench under the front awning offers full view and ambience of the TCH with its non-stop rush of semis, SUVs, pick-ups and sedans – my evening entertainment already in progress. 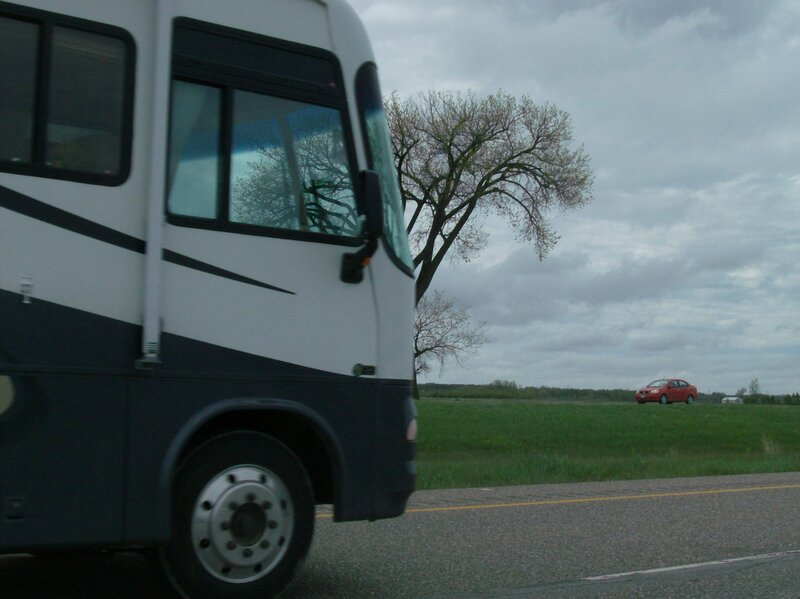 Barney’s is the worst motel at the best location – an intersection with lights of the Trans Canada Highway and Highway 10 that runs from Flin Flon, Manitoba to Corpus Christi, Texas on the Gulf of Mexico. And I am encamped here in Room 105 for the night the weather changes. 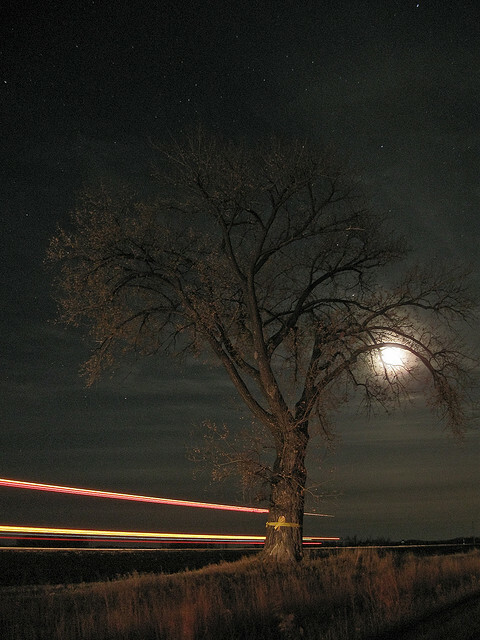 I watched the dark silhouette of a hitchhiker become waterlogged during the storm yet, afterwards, dance in wild circles under the eerie orange glow of the intersection lights, getting a ride into the wild prairie night surprisingly quickly. Barney’s Motel is a landmark in Brandon. It was there when we visited as a kid tho I don’t recall ever staying there. It always had a garish neon sign but the present endeavour is rather lame. Once a thriving concern with a reputation, fires and futility has left Barney’s bedraggled and sad. But what a location! 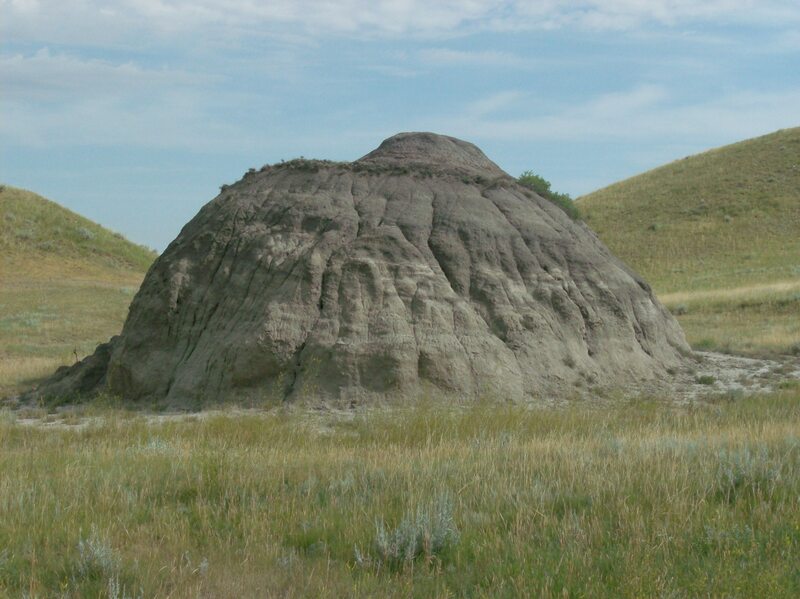 Above and south of the tiny village of St Victor, SK a row of sandstone outcrops protrude over Sylvan Valley. The view from the place is spectacular. To the north Montague Lake is a blue dash among yellow and green fields checked with black summer fallow. 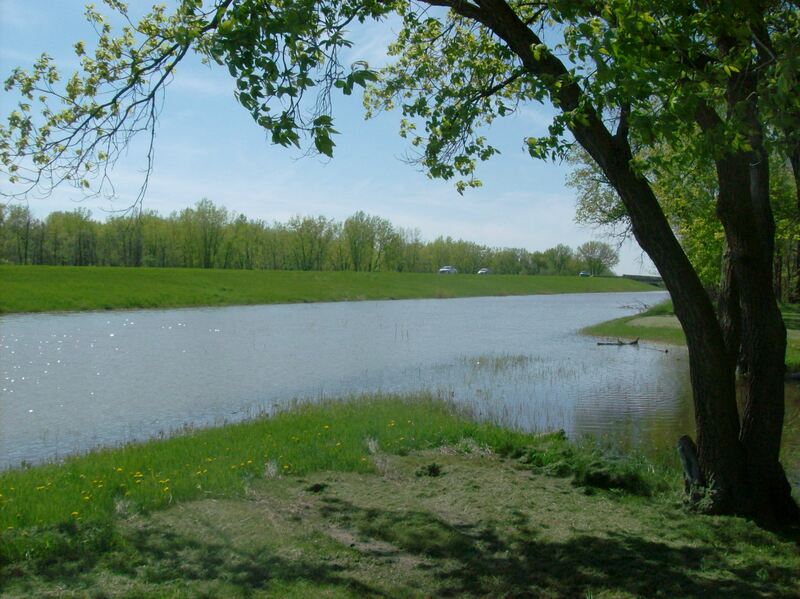 To the west is Twelve Mile Lake; in the east is Willow Bunch Lake. All three of these lakes are remnants of a wide and deep spillway filled for thousands of years with torrents of glacial meltwater. Though invisible, you are perched on the Continental Divide. Etched into the top of one of the sandstone promontories is a variety of petroglyphs, images hand carved in the stone. Turtles, human faces, grizzly bear paws with long claws, human hands and feet, buffalo, elk and deer prints with dewclaws are carved into the horizontal sandstone surface. St Victors Petroglyphs, on the flat stone beyond the fence, and its incredible setting along the western side of the Missouri Coteau. The sandstone carvings are now protected by the fence. The verdant landscape attests to the amount of rain during 2010 summer. 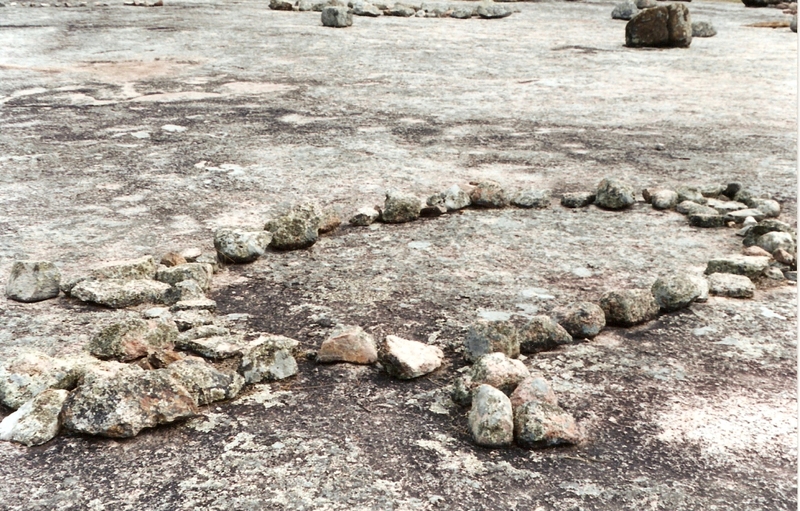 Near the outer edge of the stone, there are carvings of two human feet aligned so the next step would be into thin air or perhaps onto the ice. 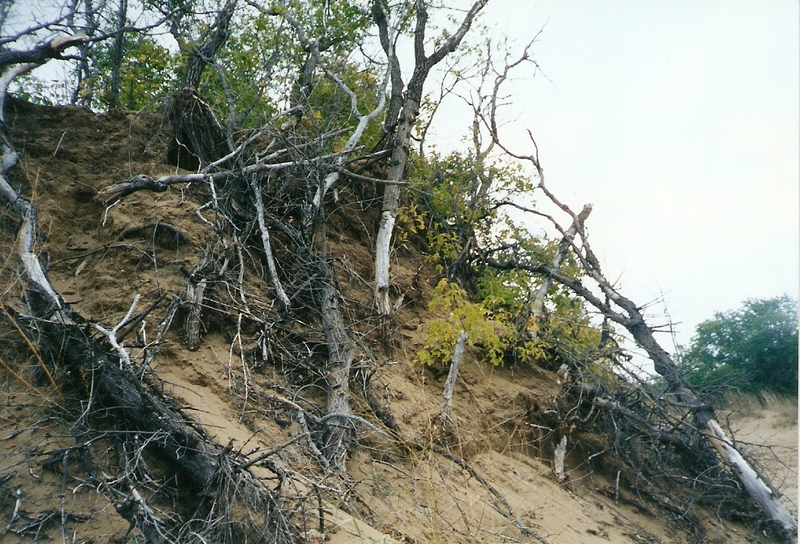 It’s possible this small site was an unglaciated area during the last Ice Age and the ice abutted this cliff. Usually petroglyphs are carved on vertical surfaces. This site is unusual because the images are on a horizontal surface making the petroglyphs difficult to see in broad daylight, claims the pamphlet. I’ve never had any problem seeing them no matter what time of day I visit. The technique used to create the carvings begins with a pecking tool and a hammer stone to create a rough outline. Then the carvers used a stick of wood with sand and water to grind out the centre and smooth the edges. Access to the petroglyphs has changed radically since my last visit. Formerly you walked up the side of the cliff on a wooden staircase, 165 steps in all. Along the way, you could marvel at the beautifully eroded sandstone chiseled, hollowed and polished by the rains. One year, in a deep crevice on the way up the cliff, I saw two turkey vulture chicks. The shiny black parent circled high and eerie above me the whole visit. Today you drive up the hill at the rear, park and follow a path to the glyphs a few hundred yards away. Previously you could walk onto the carvings and touch them. Their delicate nature carved into sandstone meant a wire fence had to be erected to protect them from the extra wear, tear and erosion of curious tourist hands and feet. The signage and seating you see in the picture are new as well. Shamanic carvings on a sandstone outcrop near St Victor, SK. If you half close your eyes, other images besides the big weird head will start to appear. 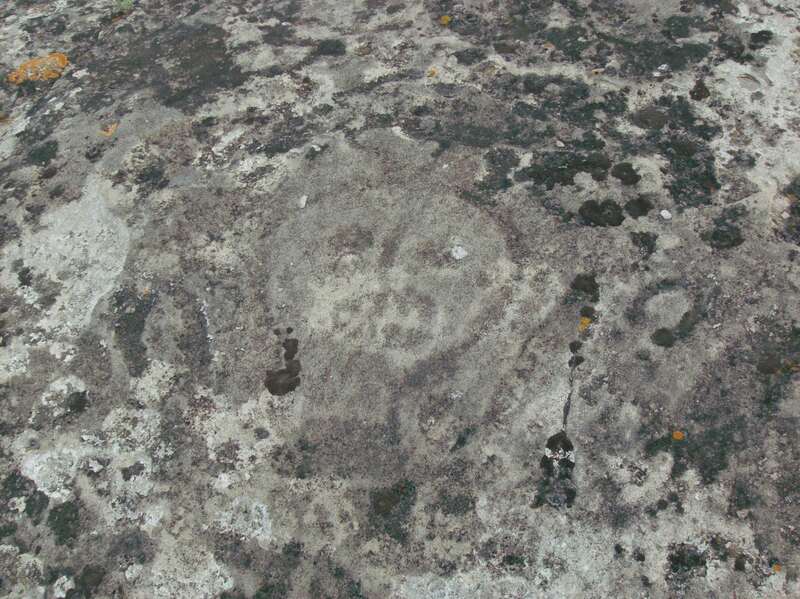 Some archeologists think hunters or maybe shamans carved these images. Often at sacred places, I can see the surrounding hillsides littered with encampments, tipis and little fires. The petroglyphs are different. 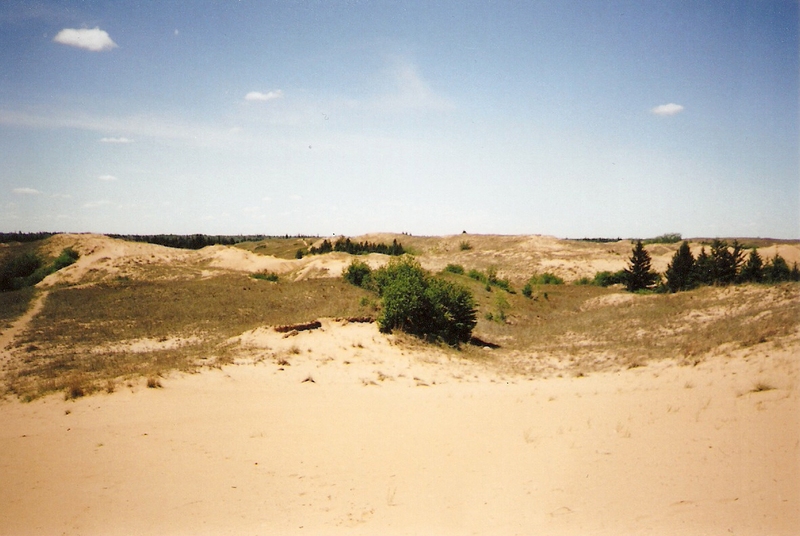 Although the rolling uncultivated landscape could support it, there are no tipi rings anywhere. This is a holy place. My old vision of the place is that individuals came here on personal pursuits, loners with missions, shamans on sacred journeys. They came to grind symbols into this rock to celebrate the mysteries of life, not to explain them, to evoke the spirits, not conquer them. They returned time and again to continue their Creation. Although the update on changes to the site is from a visit in 2010, I will report on my first visit to St Victor’s Petroglyphs on August 13, 1995. I drove in from the north in heavy wind and rain but after a short wait at the site the clouds broke and the sun peeked through. Well bundled against the persistent cold wind, I climb the stairs. At first sight, I see the work of shamans, the evocative emblems of their day: grizzly bear claws, diving turtles, dewclaws of deer and human visages. I sense their peril when they returned here in high winds like today to carve, to celebrate, to become. I receive more specifics as I start to leave. Spirit gave me an incredible gift on that day. 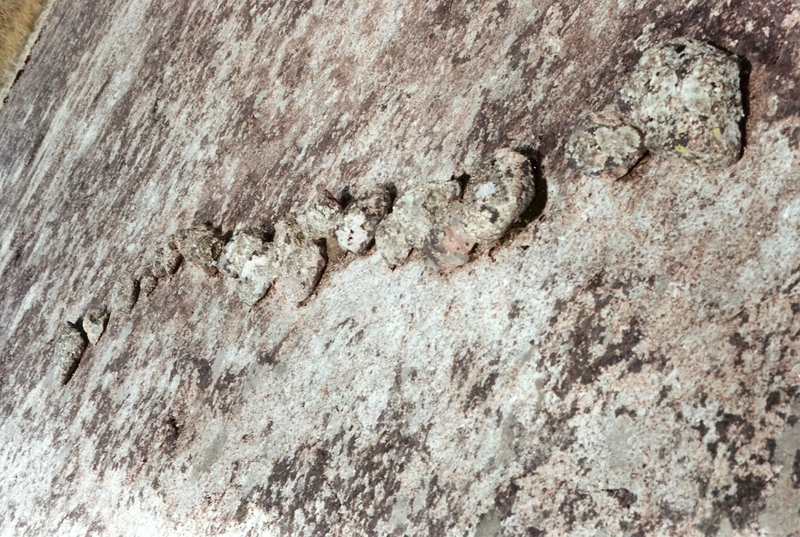 A shaman of indiscernible origin named Broken Fingers was a major carver on this rock. He worked here over 1500 years ago. I sense gnarled fingers and hands thick with scars. In light trance, I can hear his low voice muttering away against the scraping of stone against stone. He sings a creation song as he carves. Old Broken Fingers was not the only person to carve here though his style is distinctive. The bear claws and turtles are examples of his detailed nuance. Replicas of the petroglyph images carved at St. Victor’s. The two large grizzly bear claws and the two turtles on the left side are Broken Fingers’ work. They have a noticeable delicacy the others don’t have. Broken Fingers appeared as an old man when I first met him. The next time he was accompanied by a young apprentice called Crow Bear. He was an attentive student, suffered the hardships of the work gladly and promised to be an expert carver. 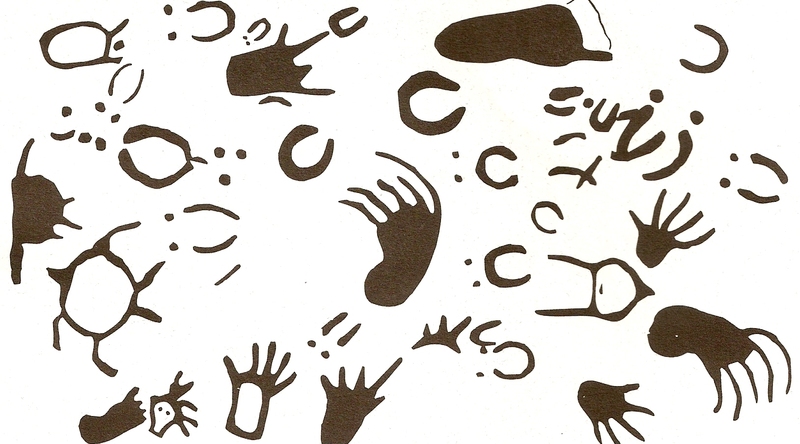 Some of the less defined works at the petroglyphs are by Crow Bear. He died at age 25 and was among the last people to carve here. For about five years after meeting Broken Fingers, he stayed close, an active and protective spirit for me when I traveled anywhere. Although less significant in my life now, Broken Fingers looms large in my shamanic mythology. Troop training for World War 1 in Manitoba was largely done at Camp Hughes, located between Brandon and Carberry south of the Trans Canada Highway. The railway ran nearby and delivered so much cannon fodder daily that Camp Hughes, for a time, was the second largest city in the province. Today the trenches, foxholes and bomb craters have been filled in and the prairie reverted to peaceful pastures. Only a small plaque indicates the camp’s history. 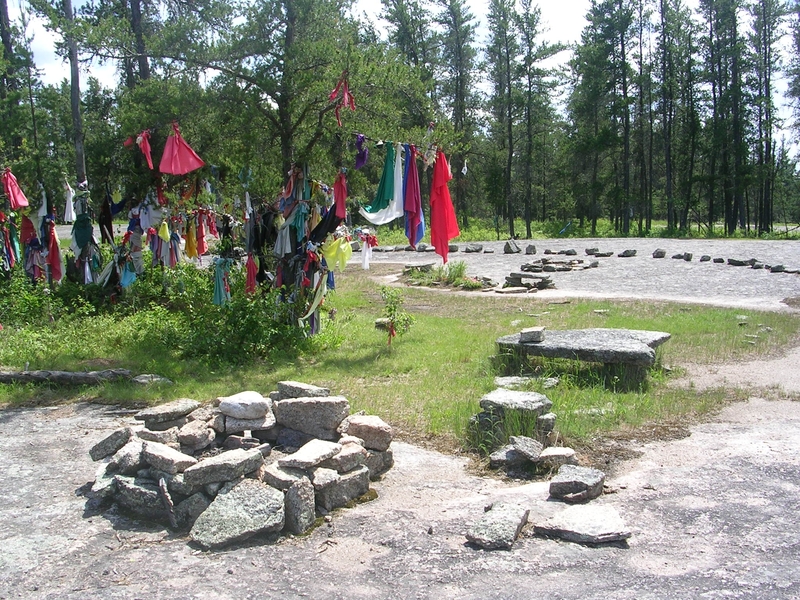 Across the TCH, Camp Hughes Rest Stop offers travelers refuge from the road, washroom and picnic facilities and a fake forest to roam in. The trees are real enough, the forest isn’t. Constructed as a make-work project during the 1930s, the rest stop’s major feature are thousands of jack pines all planted in straight symmetrical rows. The pines, mature now, have foliage on the top third of the trunks forming a dark, shadowy canopy. The red bark flakes away and on hot summer days, the air is redolent with the smell of pine. 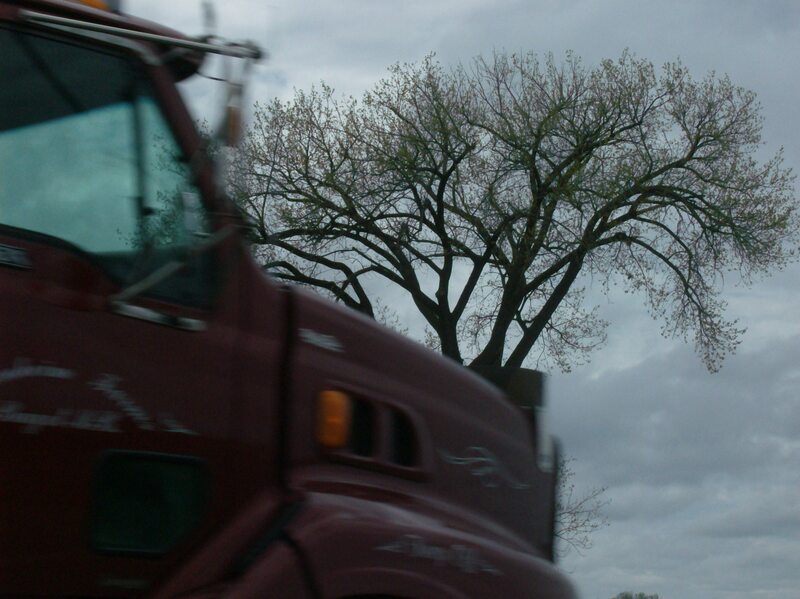 Driving past the neat rows of straight trees gives your mind a nice spinning glow. Great movie location! Covering several acres, the pines provide a sensual and sheltered place to stroll and stretch your legs. If you stop here, exercise caution because poison ivy is very prevalent on the forest floor. Otherwise, it’s a pleasant and unique walk.